So here we are, the final matchup of the YA Crush Tournament. Tomorrow, the 25th- and last-seeded Zachary Moore goes up against the second-seeded Jace Wayland from Cassandra Clare's Mortal Instruments series. As before, we'll raise money for the Tartan Army Childrens Charity, both on a per-vote basis and a bonus if Zachary wins. I'll put up a pledge form on the blog if you want to get in on the action. So far TeamKilt has raised over $1200 to help needy kids in Scotland and other countries where the national football side plays (last year they donated 130,000 pounds to help disabled and orphaned children in Lithuania and the Czech Republic). I'll tweet more snippets from SHINE under the hashtag #SHINEline. I might have to make it every 250 votes instead of 100 votes, since last time I couldn't keep up--which is awesome! Assorted giveaways, including signed copies of SHADE, SHIFT, and the ENTHRALLED anthology--plus one of those super-rare ARCs of SHINE (there are only 5 left up for grabs ever). And of course, the Big Incentives. So far I've posted four SHINE teasers (including a blasted shower scene) and promised a short story from Zachary's point-of-view, with all members of TeamKilt listed in the dedication (if you voted for Zach and want your name included, send an e-mail to jeri AT jerismithready DOT com with the subject line TEAMKILT before Round 5 voting begins). 1. I've got a Big Incentive for Logan fans, something people have been asking for since SHADE came out but I've been too nervous to try. More on that later. 2. And something really Really REALLY big for Zachary fans. A special thank-you to those who've supported him this last month. I confess, when I think about going up against Cassie Clare, I get a little queasy and have to go lie down for a while. I'm in awe of her, so much so that when we were on a panel together at the RT Convention in April, I was too shy to introduce myself, sitting three feet away. But this isn't about me. If it is about the boys, then maybe Jace deserves to win. He has more fans, and more books, and he was created by one of the nicest, hardest-working authors in the business. But to me, this is no longer about the boys. It's about the girls. Namely, Amy and Jen from Fictitious Delicious, who have gone above and beyond ANY reasonable expectations of character advocates. They've written poems, handed out flyers and candy at booksignings, and made this video that, I'm sorry, is ten times more evocative than most of the stuff that authors and publishers pay buttloads of cash for. Amy and Jen also created Team Kilt and recruited so many readers and bloggers to join--they'll make a rhyme out of your Twitter handle if you use the button as your avi--that my tweet-stream has turned to a sea of plaid. They've devoted days and weeks of their lives to getting Zachary to the next round, and the next, and the next. I've already described their dogged determination in the wee hours of Saturday morning that kept Zach close enough to win with a last-minute surge. Jen said she cried when Zachary himself checked in at 7am and she had to tell him he was behind by 600 votes. Aaaack, just thinking about it is making me cry. I don't know what I did to deserve them. So to me, this final round isn't about a boy. It's about a girl and a girl, and hundreds of other girls and guys who've supported Zachary since July 8. Do I deserve to win this tourney? No. Does Zachary deserve to win it? Maybe. Until today, Team Kilt has fought for me. But now, I'm fighting for them. That made me tear up! I love Jace, but w/a post like that, how can I not vote #TeamKilt?! Another reason...you. An author that values her readers/fans is a wonderful thing. I'll be voting my heart out for Zach in the finals! Your advocates are awesome! You're right, this is about them. They deserve to win for all the hard work and dedication they've put into this competition, and I think if Zach doesn't win, I'm going to be heartbroken for these girls. So I'm going to do everything I can to make sure that doesn't happen. Go Jeri. Go Zach. But most importantly, GO #TEAMKILT!!!! Fictitious Delicious has been ah-mazing during this tourney, making it into a complete fun-fest. No matter what happens tomorrow, they are winners. Thanks to all of you for your support and enthusiasm--you're amazing! We never expected a thing out of this more than a good time rooting for our guy Zach. I am still touched everytime #TeamKilt rallies together, and am left humbled and speechless by this post. Thank you, Jeri. You make me all warm and squishy inside. Team Kilt, baby!! As much as I love Jace, all the support for Zachary makes me want him to win all that much more. Plus, I have a thing for the underdog and Zach is an underdog, if I've ever seen one. Jeri, I personally know thoses team kilt girls and they truly are 2 of the best girls around. Oh Jeri.. if you hadn't convinced me before you most definitely have now!! It speaks volumes about a writer when so many people stand behind her in support. I hope you know (which I am sure you do!) how much you are loved in this YA community. Go get em' tiger RAAWWWRRR! Breaking up with Jace was hard to do. I actually felt a pierce in my chest. However, Zach AND Logan were quick to repair it. I couldn't fight my feelings for them any longer, and I owed it to Jace to be honest and end our relationship. While Jace will always be special to me, I'M TEAM KILT ALL THE WAY BABY!!! BOOYAH! Simply put, you rock my world as much as Zach does! Because of you lovely ladies and the SHADEboys, I was convinced to start my Twitter account. Also, to the ladies of Ficticious Delicious, you had me from Zach's first round with your awesome representation of him. I laughed and knew automatically that he had my vote, and it also convinced me to read the series! What a fun tourney, A-MAY-ZING series, and truly talented and zany group of people. Much love. Let's win one for Zach, Jeri, and all of TeamKilt! Now that my internet access is kinda spotty, I can't keep up with all the new (and old-but-undiscovered) authors out there, of which you were one before the contest began. Those girls who created that poem stole my heart away. I would have voted for Zach simply for the convoluted reason that you're friends with Sam, and I'm friends with Sam, and Sam was supporting you, and so I would to, but then I got a look at the case Amy and Jen made for him, and it was so impressive and detailed and just lovely that if I'd stumbled across it at random, I would have voted for him on the strength of it alone. And now he's made it into the finals, and I'm thrilled to bits for you, and Zach, and the Girls. I'll be voting as much as I possibly can tomorrow, and encouraging everyone else to vote, and then while I'm waiting for the page to load, I'm going to be checking your books out at the library so I can see for myself what inspired such an inspiring bit of poetry. I was going to vote for Jace, but now I'm 100% Zachary/ team Kilt. Two years later, this post STILL brings me to tears. What a magical summer this was. Welcome to the YA Scavenger Hunt! YA Crush Tourney Round Dhà! 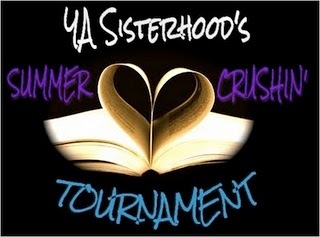 Zachary in the YA Summer Crushin' Tournament!